Proof of this detail is demonstrated in a letter sent by Pope John IV (consecrated in December of 640 C.E.) to the Scots for the sake of persuading them to amend their System D position. With the force of the Christian emperor of Rome behind the decision, the western assemblies moved to force all other Christian assemblies to unify under just one common system for celebrating Passover. At the same time, during this period the eastern regions came evermore under the increasing pressure from the western assemblies, especially after the Council of Nicaea (325 C.E. ), to convert to System E. This heavy western influence eventually resulted in the adoption of System E throughout the East, but not right away. During this time of upheaval in Syria, and as a transitional phase, some of the Syrian Christians created a hybrid form of the Passover celebration that incorporated aspects of both System A and System E.
The Didascalia Apostolorum, composed in the first decades of the third century C.E., reflects the Ante-Nicaean portion of this transitional phase for those of Syria following the Quartodeciman System A premise. Meanwhile, some of the Syrian Christians were influenced by the Roman model for the celebration of the Sovereign’s day (= the day of the resurrection), which was more fully developed in the latter half of the second century C.E. under Pope Victor. While still keeping the Passover on the 14th, they began to observe the following Friday and Saturday as a commemoration of the death and burial (time in the grave) of the messiah and the first day of the week as a commemoration of Yahushua’s resurrection. A major alteration came after the Council of Nicaea (325 C.E.). 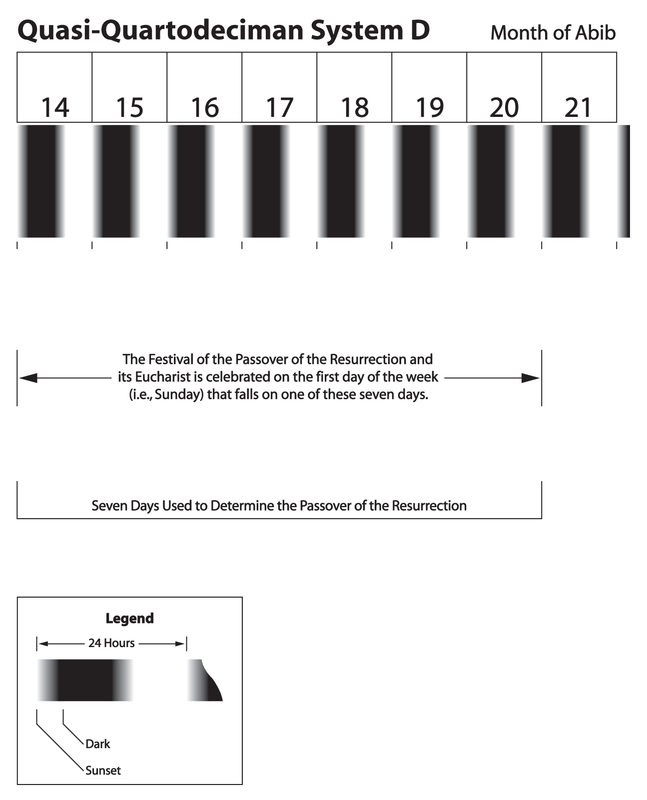 In order to accommodate Rome, yet in an effort to maintain their original Quartodeciman premise of observing the 14th as the day of Passover, many of the Syrian Christians adopted the Hasidic System B for the seven days of Unleavened Bread (though, like Rome, they disregarded the 15th and 21st days of Abib as always being high Sabbaths). Nevertheless, they continued to observe the Passover on the 14th day, thereby increasing the celebration of the festival to eight days. In doing so, they developed a Quartodeciman hybrid we call System F.
With the acceptance of System F, the Syrians eventually accepted the Roman Catholic construct (System E) in its entirety. Indeed, by the end of the eighth century C.E., the whole Christian world, including the East, was established in that camp. It is not a system known to have been argued by any of the early Jewish or Christian assemblies but, because of its similarity to System F, the claim by its advocates that it was the correct and earliest practice, and due to its popularity, we shall address it. As with the old Syrian system, the Passover supper is observed on the night of the 14th. The 14th is itself considered a memorial day. Meanwhile, as with the neo-Aristocratic System C and the Christian System F, the advocates of this view imitate the Hasidic method for counting the seven days of Unleavened Bread, i.e., from the 15th until the end of the 21st of Abib. In most variations of this system, the 14th is a day to eat Unleavened Bread. Neverthe­less, the 14th is neither kept as a high Sabbath nor is counted as one of the seven days of Unleavened Bread. Rather, the honor of a high Sabbath is given only to the 15th and the 21st of Abib. The 15th is also kept as a supper and is called the Feast of Unleavened Bread. When System D failed to have a major impact on the conservative Quartodeciman groups, tactics in the West were changed and System E was adopted, being roughly the present practice of the Roman Catholics and Protestants. This innovation followed the Hasidic construct for observing the seven days of Unleavened Bread, i.e., from the beginning of the 15th until the end of the 21st day of the first moon. Emphasis is placed on the day of the messiah’s resurrection, being the first day of the week falling within the seven days of Unleavened Bread. The advocates of System E do not allow that the 14th of the first moon is the day of the legal Passover supper mentioned in the Torah of Moses. Instead, the evidence that the messiah and his disciples kept the Passover sacrifice and supper on the night of the 14th, therefore before Yahushua’s death, is interpreted as a pre-Passover enacted parable. The “Last Supper,” accordingly, was merely a foretype of the Christian Passover that was to be kept on the first day of the week that fell from the 15th to 21st days of the first moon, being the celebration of the messiah’s resurrection. System F, meanwhile, was a Syrian development that sought to breach the differences between System E and the opposition forces from System A. Nevertheless, it actually served as a transitional phase in Syria and other parts of the East, leading them from System A and System D to System E.
Once the East had come to the understanding that the seven-day period for Unleavened Bread actually extended from the 15th until the end of the 21st, it opened the door to the full acceptance of the Hasidic premise for the System E construct. When this transition period was over, the East had adopted System E.
The present-day incarnation, so-to-speak, of System F is System G. It is not a system known to have been argued by any of the early Jewish or Christian assemblies. Meanwhile, as with the neo-Aristocratic System C and the Christian System F, the advocates of this view imitate the Hasidic method for counting the 7 days of Unleavened Bread, i.e., from the 15th until the end of the 21st of Abib. 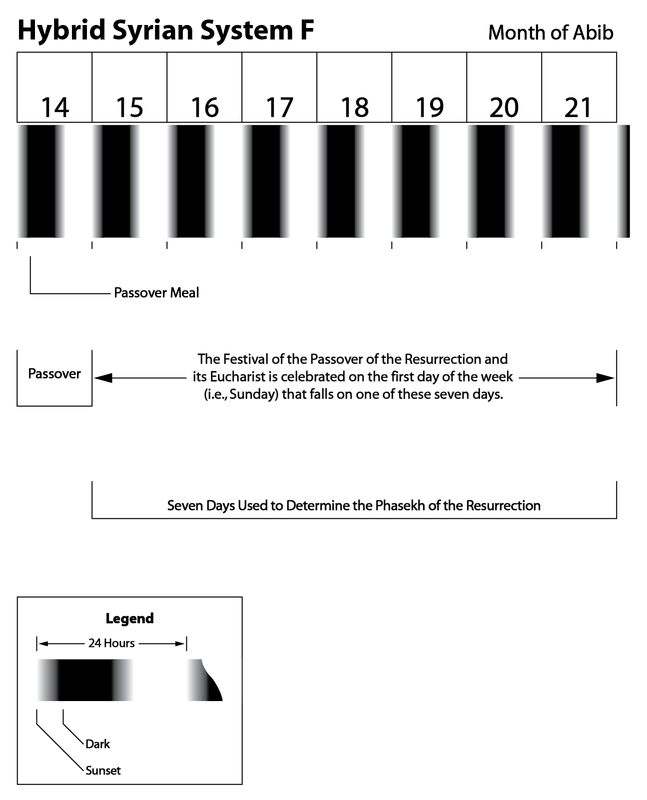 Like its antecedent (System F), System G also observes the 14th as Passover. It differs in that it does not observe the first day of the week following the 14th as the Passover of the resurrection, though it does count that day as the first of the 50-day count to Pentecost. Rather, the adherents of System G keep the 15th as the Feast of Unleavened Bread and observe both the 15th and the 21st as high Sabbaths. It should be noted that System G considers the Passover meal at the beginning of Abib 14 to be only a memorial supper since it would not occur on a high Sabbath day. At the same time, System G requires unleavened bread to be eaten with the memorial Passover supper at the beginning of Abib 14. 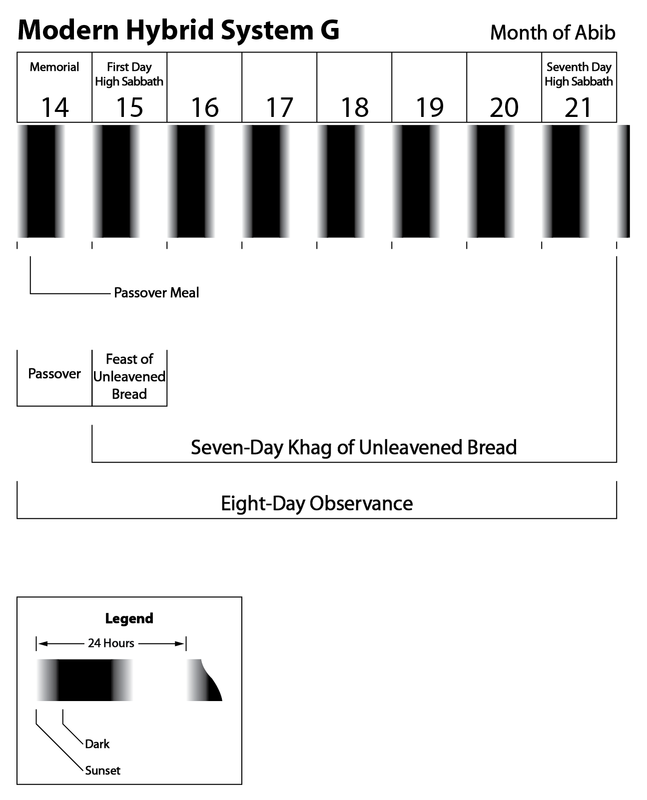 Importantly, unleavened bread is to be continually eaten during the following 7 days of the Festival of Unleavened Bread, Abib 15-21. 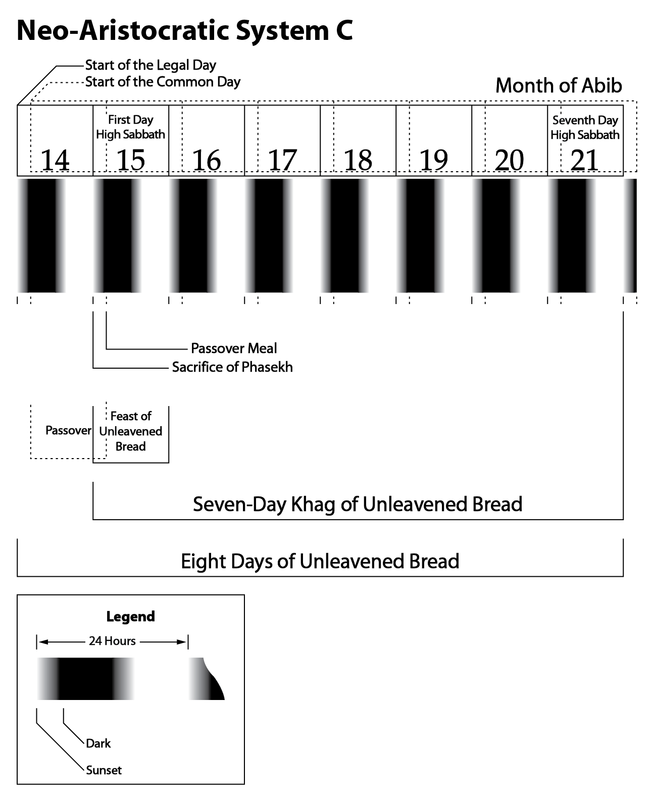 Under System G, there would be required a total number of 8 days of eating unleavened bread, Abib 14-21. It looks like it’s time to conclude this post and head on to the summation of what has been presented by the Passover Series so far. So be on the lookout for our next installment 29. Passover – What Now? 4 Jerome, Epist., 15, cf., 16. 7 Didas. Apost., 21, 5:20:10. 11 Cyrillonas, 5, lines 101-103. 13 Didas. Apost., 21, 5:18, 5:19:6. 14 EEC, p. 187, n. n.
15 Aphraates, Dem., 12:6–8, 12–13. 18 Some notable Sacred Name groups that utilize the System G construct are the Assemblies of Yahweh, Yahweh’s Assembly in Messiah, Yahweh’s Restoration Ministries, Assembly of Yahweh 7th Day, and Yahweh’s Assembly in Yahshua. This entry was posted on 02/14/2013, 1:53 pm and is filed under Calendar, Easter, Feast Days, High Sabbaths, Holy Days, Passover, Quartodecimans, Religion, Unleavened Bread, Yahweh. You can follow any responses to this entry through RSS 2.0. You can leave a response, or trackback from your own site. I haven’t read any comments in a while….. Are we pondering? Stunned into silence? Lost in thought? Lost our train of thought…? If you don’t agree, speak!